In addition to Quicksend, a robust emailing tool unique to Propertybase, you also have access to Salesforce Email as a Propertybase customer. Salesforce emails are especially useful when setting up basic automations and workflows. They are also useful for internal notifications. Salesforce emails do not support HTML, so images cannot be used. In order to create an email template, you should go to Setup > My Personal Information > My Templates. On that page, click “New Template”. Then choose Text as the type of email template. Choose the folder you would like the template to be in and give it a unique name. Click on the availability checkbox to make it ready for use. When selecting the encoding option, we suggest the Unicode (UTF – 8). This will pick up the majority of written symbols in different languages in the text. The subject you select here will be what displays when your email is sent. The email body is where the text for your email template goes. 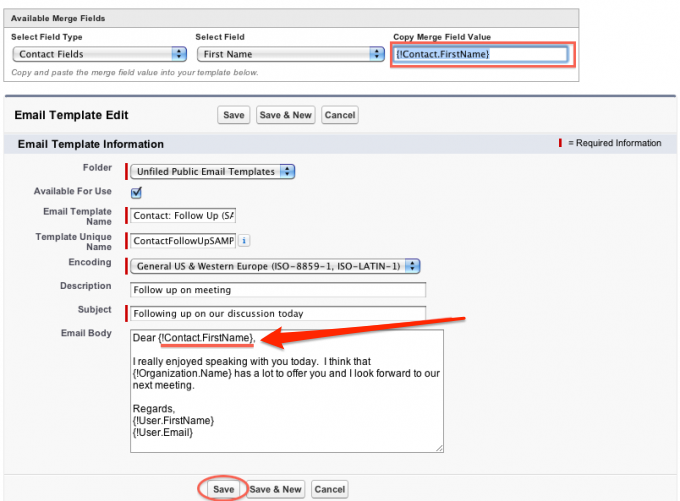 After writing your email, use the merge fields to personalize your content. In most cases, text or data variables will be changed each time the email template is used. For example, in the greeting “Dear Frank,” “Frank” is a variable, because it will change when the email is sent to someone different. Use the merge fields to fill in every variable so that every time this email template is sent it will have the correct information. Then save the email template and it will be available for use! Below is the example template preview.